Today I want to tell you about the wrap that I had in my hands for just a while but which I will remember forever. I became a tester of handwoven Fiddling Weaver wrap and I am very gratefull for this opportunity, cause I know that there were many entries for tests. I don’t have very big experience in carrying in such unique wraps so it was very interesting experience for me. Looking at the wrap I couldn’t believe how it is possible for such a solid piece of fabric to be woven by small womans’ hands and how much work, heart and emotions were put into it. 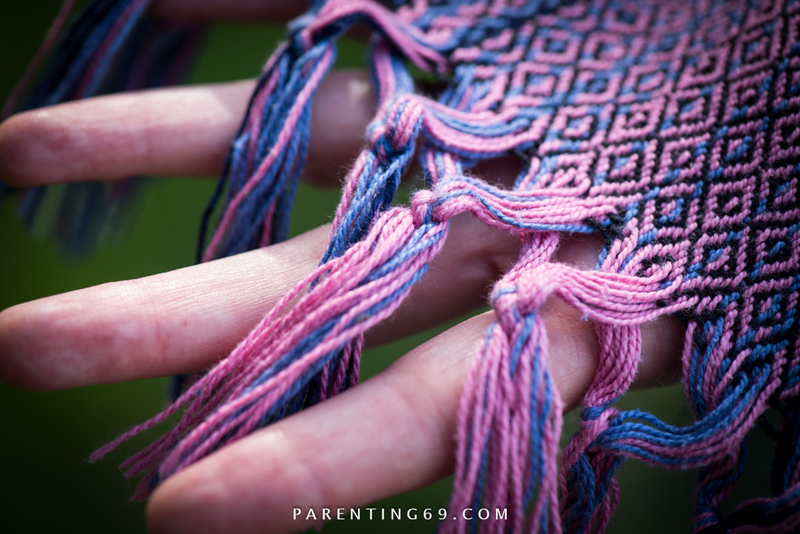 This is such a great talent that I admire in all weaving Mums. The wrap that I want to show you is Forest Aurora with black weft, 100% Egyptian cotton woven in diamond weave. It’s 4.2 m long and finished with cute fringes which I really liked. 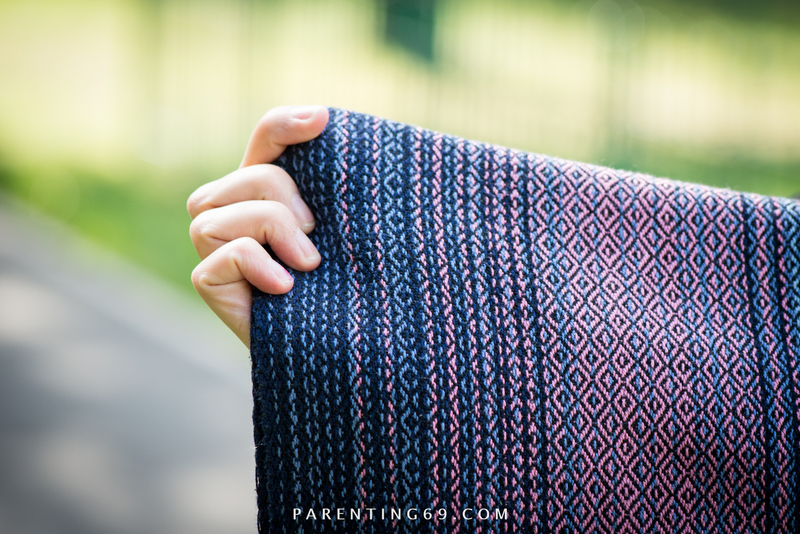 Diamond weave is my favourite weave pattern so I was even more enchanted when I saw it in a handwoven version! I couldn’t stop staring at it! I was holding it for a long time and delighting with every thread. Fiddling Weavers’ Forest Aurora is full of contradictions and cannot be described in only one way. I saw in it delicacy, tenderness and amazing softness of the yarn it was made of. It was incredibly soft and I was one of the first to test it so it was even not broken-in yet! And I would say, it did not need any breaking-in. It is not a wrap with which you must fight during wrapping. 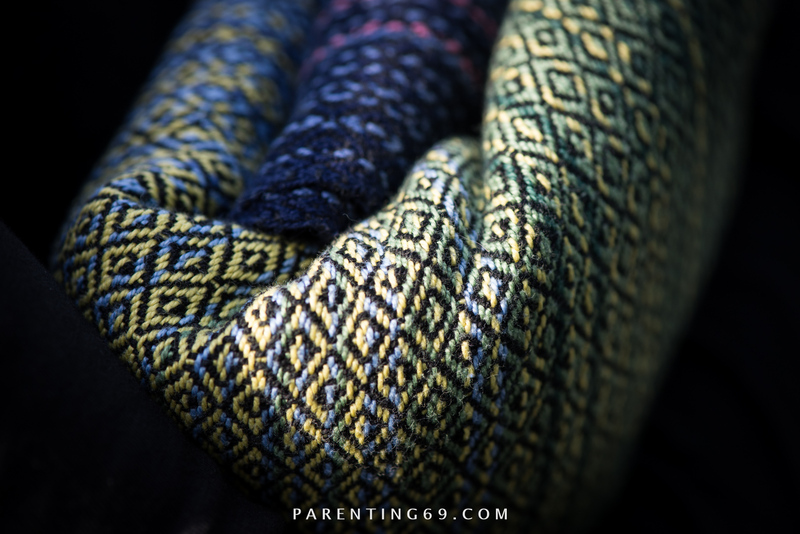 It works like a soft scarf in which you enfold yourself and your child. There is also unbeliveable strength and firmness in it because it’s densely woven and this is the reason for its’ supportivness. I was testing it with my one-and-a-half year old daughter and despite she’s not a very big and heavy child, 10,5 kg of her weight would be clearly felt in another wrap. It is of medium-thickness – it didn’t sug into my shoulders, I didn’t feel my child weight and the knot was not bulky at all. 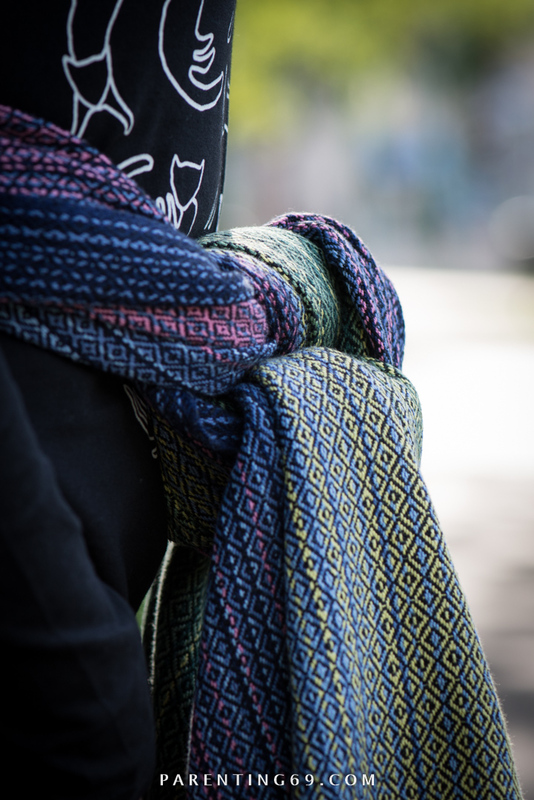 Selvedges are unhemmed and it does not make wrapping harder nor easier, it’s just a feature of this wrap. I expected slightly shorter wrap and when I got it, it occurred that I am able to wrap a FWCC with ease when my daughter took a nap. The wrap works with rings well, too. I did not make a photo of ring finish but I had a chance to check it and it worked perfectly. To sum up: Handwoven Forest Aurora with black weft is strong, dense and soft all in one. Medium-thickness, woven in my favourite diamonds and finished with neat fringes. It’s light-weight and let me to make a few basic carries with interesting ring finishes. It also carries very personal message from a woman who wove it with thought of other mums and their children who will be carried in it. It’s full of positive energy. 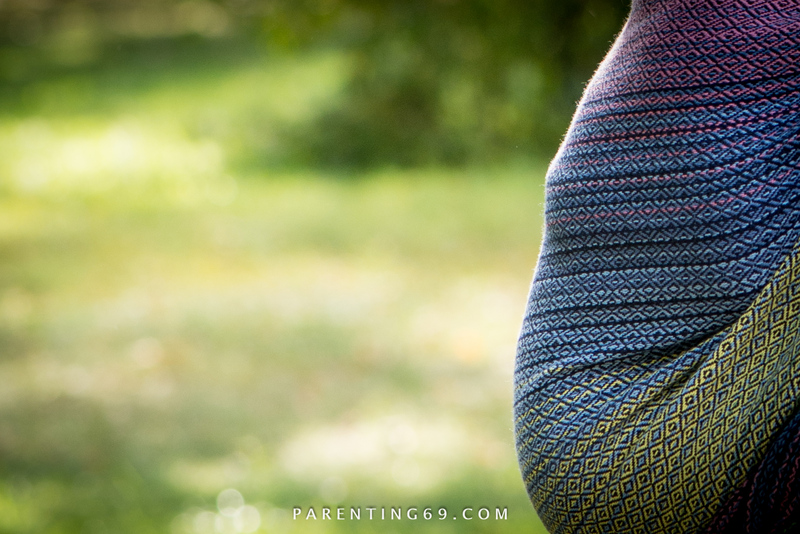 This is the one handwoven wrap that I dream of to have in my stash. It has only one disadvantage – for this moment it is beyond my financial range and because of this I am even more happy that I had an opportunity at least to test it. It was an experience of a great comfort. Thank you for this! 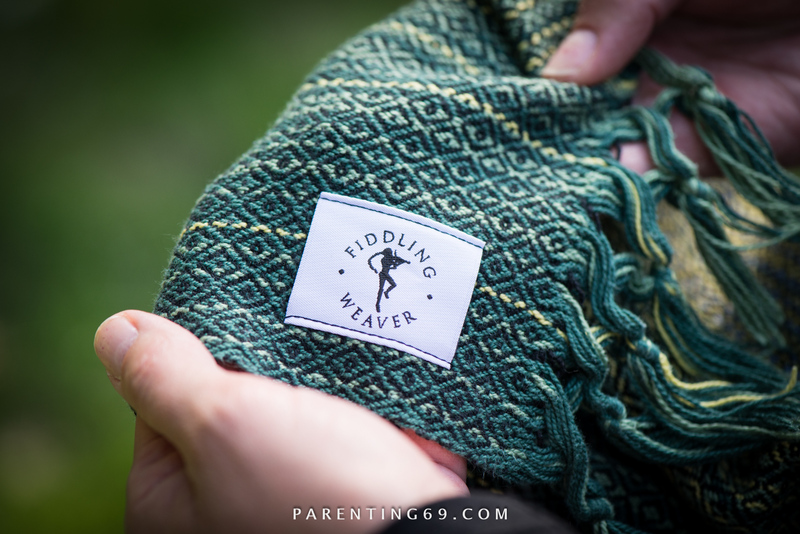 If you would like to chat with FW fans – join Fiddling Weaver wraps – chatter & reviews.